A car isn't a single, dimensionless point; it occupies space. The tires are mounted out near the corners of that space, but the Center of Gravity is located somewhere near the middle of the space. Accordingly, as grip levels change in reaction to weight transfer (which in turn is induced by driver control inputs) it is likely that one end of the car will lose grip before the other. When it does, the resulting moment will cause the car to either refuse to turn any harder (if it is the front tires that reach their limit first) or turn in more than expected (if the rear tires reach their limit first). Controlling which end of the car breaks loose first - and how suddenly - is called balancing the car. Oversteer, when the rear tires break loose first. If you are from the Southern United States (NASCAR country) the terms "push" and "loose" are also used to describe balance. I use the terms interchangeably - it's kind of a Canadian thing to be bilingual. Balance also has a degree or amount as well. "Mild" normally indicates that the car is still controllable, but it takes either a larger or smaller driver input than expected to achieve the desired track through the corner. "Severe" usually means the car fails to complete the corner at all. So for example, "mild understeer" means the driver needs to turn the steering wheel a little more than expected to track the desired corner radius. "Severe oversteer" or "snap oversteer" means the car swapped ends and spun out. 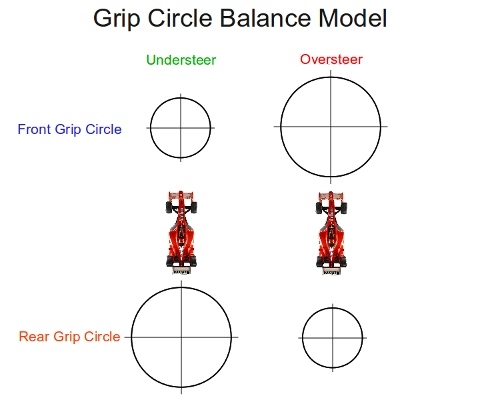 One way to imagine balance is to envision the car with two Grip Circles - one for each end of the car. If the front Grip Circle is smaller than the rear, then the car has understeer. If the front Grip Circle is larger than the rear, then it has oversteer. Case 2: Driver enters corner but near midphase thinks he's going too fast and touches the brakes. Car is production-based (so nose heavy) and has been slowing down (so weight is transferred forward so front tires have more grip) meaning rear tires are at the limit when driver applies braking force. Grip asked of rear tires exceeds that available and car spins out. Driver complains of midphase oversteer. Case 2 is a good example of why it is so necessary to install a data logger in the car - that brake application would show up in the data logs and much time wasted chasing a false balance problem can be avoided. But once you have eliminated driver-induced balance problems (or you are at least satisfied that the driver isn't doing anything fundamentally wrong) it then becomes necessary to figure out how to fix a balance problem. Unstick the end of the car that is sticking too much. Using our twin Grip Circle balance model, Option 1 is to grow the smaller of the two Grip Circles to match the bigger, where Option 2 seeks to shrink the larger Grip Circle to match the smaller. Of the two options, Option 2 (unstick the sticky end) is by far the easiest, and if it is crunch time, can be used to tame an ill-handling car. But it has the drawback of slowing the maximum possible performance of the car, because the combined Grip Circle has been shrunken. Option 1 ultimately results in an overall faster car. Setting balance is normally a function of weight transfer. Remember that we stated earlier that a given pair of tires produces maximum grip when equally loaded. That means that we can reduce grip produced a given pair of tires by increasing weight transfer across them, and we can increase grip produced by a given pair of tires by reducing weight transfer across them. This is true all else being equal. But if all else is not equal - for example, if the suspension design makes it impossible to keep both tires in their camber "happy place" in roll (MacPhearson strut) increasing weight transfer from an unhappy tire to a happy tire may very well produce more grip on that end, not less. The front suspensions on 3G/4G GM F-Bodys, BMW M3s, and Ford Mustangs all do this. And on AWD cars with sophisticated differentials, all bets are off. Model your suspension first and know how your car's camber angles change in roll! Accordingly, your first job is to set the springs to produce the required natural frequencies. With that accomplished, you probably couldn't limit the max roll angle to where you needed it to be (according to your suspension model) with just springs without getting into stupid-high natural frequencies, so you probably needed sway bars to further limit roll. But sway bars work by increasing weight transfer across the two tires at that end - so we want to adjust total stiffness to keep the roll angle in check, and then adjust stiffness bias (by keeping total roll stiffness the same but changing the relative stiffness of the front and rear bars) to set mid-corner balance to minimal understeer and a little entry oversteer. A neat trick is that if roll stiffness distribution exactly equals weight distribution, all else being equal, that makes the car neutral. So set the rear roll stiffness distribution percentage a tick larger than the rear weight distribution percentage and you're in the ballpark. This will unquestionably have to be verified by testing, but it makes a great starting point. A slightly - and I mean slightly - tail-happy car is faster, especially in slaloms, but it can be easily overdone to the point where the car wants to snap-spin on corner entry. That's not fast; it hurts driver confidence and limits his ability to really attack the course. So a little bit of oversteer, but not too much. Don't overdo it! I've seen drivers overestimate how much entry oversteer (including myself) they are capable of dealing with and ultimately wind up slower. I've had a number of people ask me if I included the sway bar rate (along with its motion ratio) to work out natural frequency and subsequent damping - no, I did not. The contribution of the roll bar to overall spring rate is so small - and it isn't always there - so it didn't seem worth trying to chase a force change that small. If you have sway bars so stiff that they are affecting damping... I think you need to stiffen up the springs and lighten the bar. Roll bars should be trim controls, not major players. The aim here is to get the balance as close to perfect as possible by tuning the sway bars. Ideally, this is done by testing on a surface and in weather conditions that most closely replicate those you expect to encounter in your most important race. (Peru made a great replica of Forbes Field) If the surface or conditions on the day differ from those tested, you should be able to restore balance through either changing the sway bars (either via outright swaps of via adjustable bars) or via tire pressure changes. Do not attempt to change balance by changing the shocks, except in cases of dire emergency. Shocks do not change the amount of weight transfer, they change the speed at which certain types of weight transfer take effect. Once the car is at full roll, the shocks contribute nothing to balance, and if they are having any effect on balance during either roll-in (entry) or roll-out (exit) then they are probably maladjusted to their proper job. The only exception is a Stock class car with poor sway bar choices.